Our self defense classes at SwiftKick Martial Arts Carlsbad focuses primarily on developing practical skills for self-defense. 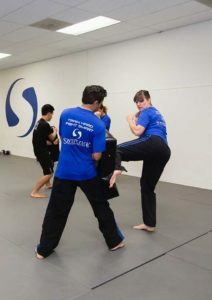 SwiftKick Carlsbad’s curriculum draws influences from several martial arts training systems. This approach allows our clients to feel confident in adapting to a variety of self-defense situations that may involve striking, grabbing, and ground work. Some of the styles that are implemented in our training curriculum include Boxing, Kickboxing, Muay Thai, Wrestling, Catch Wrestling, Jiu Jitsu, and Street Self-Defense. Essentially, we provide cutting edge Mixed Martial Arts (MMA) and Self-Defense training to everyday working professionals that is proven to be effective in professional fighting, law enforcement, and military worldwide. In our Carlsbad studio, we separate our adult self defense class curriculum into modules in order to maximize skill development in a variety of areas: kickboxing, striking, defense, ground and takedown defense, close quarter combat (i.e., grabs, chokes, etc. ), and weapons defense. This method of training provides comprehensive self-defense training to our clients giving them the mental and physical edge needed in a self-defense situation. Our Champion Self Defense Classes in Carlsbad consist of working professionals from many different backgrounds coming together to have fun and learn without the ego and hyper-competitiveness sometimes found in some martial arts and self-defense training programs throughout San Diego County. An opponent will be unpredictable and continuously resisting by moving, hitting, and grabbing. Self Defense Kickboxing CarlsbadHow our training helps our clients: We teach clients to train against resisting partners in class who consistently move, grab, and hit back. This is done through practical sparring which helps clients remain locked down, structured, in balance, and utilize effective striking, defense, and movement against an active, live opponent. In an adrenalized state, our sympathetic nervous system is enacted. In this physiological state, blood moves from extremities to large muscle groups to prepare for fight or flight. Fine motor control diminishes but gross motor movements are enhanced. How our training helps our clients: We focus our training on relatively simple, uncomplicated skills and techniques that are proven to be safe, effective, and efficient in a self-defense situation. Through time and regular training, these skills become hardwired responses. How our training helps our clients: We help our clients build psychological confidence in addition to physical skills. Training is designed to familiarize clients with what normally would be considered intimidating (i.e., getting punched, grabbed, taken down, etc.) and empowering them to perform well in a self-defense situation. We use proven methods in psychology and sports psychology to practice maximizing performance in a hyper-adrenalized state. Many of our adult clients are working professionals in engineering, real estate, the medical industry, and small business owners. In fact, several hold PhD’s in various fields. The clients in our Carlsbad Self Defense classes love the physical and intellectual challenge our training offers. There’s nothing else like it! After training with SwiftKick they have found that the martial arts training they have received has helped them improve in their confidence, work efficiency, and ability to manage stress both in their professional and personal lives. Furthermore, we firmly believe that being in great shape is a huge part of self-defense. 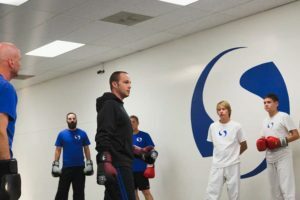 Adults in all stages of life enrolled in our program have indicated increased energy levels, weight loss, increased strength and conditioning, and lower cholesterol as a result of their training with SwiftKick Martial Arts Carlsbad.